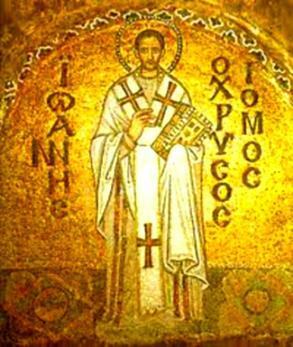 Although this great saint did not actually die for the faith by the hand of the executioner, yet Saint John Chrysostom may be styled a martyr, as he died of the maltreatment which he received for defending God’s honor and the rights of the Church. Saint John was born at Antioch, about the year 347, and was descended of one of the most illustrious families of that city. His mother, being left a widow at the early age of twenty years, took particular care in the education of her child, and placed him under the most eminent masters, to study rhetoric and philosophy. It was expected that the pious youth would attain to great worldly fortune; but he, from his twentieth year, applied himself to the study of the sacred Scriptures and to prayer, and dedicated himself entirely to the service of his crucified Lord. Whereupon Saint Meletius, his bishop, took a great liking to him, and having instructed him for three years, made him Lector of his own church. Nectarius, Patriarch of Constantinople, died in the year 397; and as the name of our saint had obtained great celebrity throughout the entire province, the Emperor Arcadius, the clergy, and people, agreed in having him promoted to that see. The emperor accordingly summoned him to Constantinople and without making known to him his design, took him into his carriage, and brought Saint John Chrysostom to a church outside the city, where, notwithstanding his reluctance, he was consecrated by the bishops previously assembled. The see of Constantinople had unfortunately been governed for sixteen years by Nectarius, a man without learning or zeal; so that this great city, containing as it did so many strangers and heretics, required a thorough reform. To this Saint John Chrysostom gave his entire attention. With an untiring and holy zeal he labored for the reformation of his clergy, and endeavored to suppress the avarice and haughtiness of the emperor’s court; this made for him many enemies. It happened that there arrived at Constantinople some monks, who had been expelled from Egypt by Theophilus, Bishop of Alexandria, under the pretext of Origenism; but Saint John being satisfied of their innocence, wrote to Thophilus in their favor, beseeching him not to disturb them. He, however, being a haughty and vindictive man, succeeded in raising a persecution against the saint for protecting the monks. The emperor indeed summoned Theophils to Constantinople, to account for his conduct; but he easily gained over to his side the nobles, bishops, and clergy, who were opposed to St Chrysostom. But the greatest acquisition to his party was the Empress Eudoxia, who bore a mortal enmity to our saint, on account of having been rebuked by him for her avaricious rapacity in depriving Callitropa of her money and another widow of her land. Backed by this party, Theophilus was enabled to get together a cabal of thirty-six bishops, who from the place where they met styled themselves the Synod of the Oak, and having drawn up some false accusations, deposes Saint John from his bishopric, and obtained from the emperor a decree or his banishment. The people, hearing of the decree, surrounded the church to defend their bishop; but Saint John, to avoid a sedition, escaped through a private door, and surrendered himself to the guards, who brought him to Bithynia. On the night of the following day Constantinople was shaken with an earthquake, which was regarded a sign of God’s displeasure by all, not excepting Eudoxia, who in the greatest consternation besought the emperor to recall the holy bishop. The entire population went out to meet him, chanting hymns, and bearing lighted torches in their hands, and having arrived at the cathedral, obliged Saint John Chrysostom to seat himself upon the Episcopal throne. Theophils and his party having fled from Constantinople, the saint resumed the discharge of his pastoral duties, and was treating with the emperor about the convocation of a council to vindicate his innocence, when a new accident totally changed the aspect of his affairs. In the square before the great church of Saint Sophia a silver statue had been erected to the empress, where dances and public games were performed, which disturbed the sacred offices of the church. The saint strongly rebuked the people for this irreverence; but his zeal only infuriated the Empress Eudoxia, who to satisfy her revenge availed herself of the enmity which Theophilus and other bishops bore our saint. They formed a second cabal, in which they condemned and deposed Saint John Chrysostom, under pretext that he had reassumed the Episcopal function, without having justified himself in synod. In pursuance of this most iniquitous deposition, an order came from the emperor that he should not enter his church, and he accordingly departed from the city. As this happened upon Holy Saturday, the saint retired to a country chapel, in order to celebrate the sacred offices; but his enemies obtained a troop of four hundred soldiers, and entered the church, where baptism was being administered, wounded some of the priests, and injured some of the children who were about being baptized. Their sacrilegious impiety went so far as to trample on the Blessed Sacrament! Such, in fine, was the uproar, that many of the people ran, in consternation, to hide themselves in the woods and valleys. Although the Emperor Arcadius had no personal enmity to St John, he was induced by the importunity of his wife and the hostile bishops to send him into banishment. The saint having received the order, took leave of the bishops who were his friends, and departing through a private door, delivered himself to the soldiers who obliged him to travel day and night, until they arrived at Cucusus, a small city of Armenia, the place of his banishment; the journey lasted seventy days, during thirty of which the saint suffered from a tertian fever. When they arrived at Cucusus, the bishop of that place received Saint John Chrysostom in his house, who thus found some repose after so much suffering. The saint here did not remain idle, but employed himself, as much as possible, in instructing the people and relieving the poor. He also wrote many letters to console his friends, and to assist the churches which had been lately founded in Persia and Phoenicia. Meanwhile, Pope Innocent I, having been informed of the injustice done to St John, did all in his power to assemble a synod where the innocence of the saint would be definitely declared. But his enemies labored successfully to prevent its celebration, and jealous of the fame he was acquiring in his first place of exile, prevailed upon Arcadius to banish him to Pytius, a small town on the borders of the empire. Saint John Chrysostom was accordingly consigned to two officers, one of whom was a most brutal man; and having been instigated by the enemies of the saint to cause his death by maltreatment on the road, he obliged him to travel in the most violent rains and amid scorching heats, not allowing him to rest in any town, but halting at obscure villages, where no accommodation could be found. Having said “Amen,” Saint John Chrysostom gave up his soul to God, on the 14th of September in the year 407, being about sixty years of age, and having been bishop mine years and almost seven months. A great concourse of monks and persons of rank came from the neighboring provinces to celebrate his funeral. God did not delay the punishment of his enemies, and especially of Eudoxia, who died a few days afterwards. She was soon followed by Arcadius, who expired in his thirty-first year; and these deaths have generally been considered the effects of divine wrath. The persecution against the followers of Saint John Chrysostom did not end with his death. Tygrius, a priest, and Eutropius, a lector, were particular objects of vengeance; because, after his second departure from Constantinople, the great church of St Sophia and the senate-house were burned down, and these two ecclesiastics were accused of having done so maliciously. Optatus, an impious pagan, was governor of the city, and he first put Eutropius, as being the younger, to torture, in order that he might reveal the authors of the fire; but Eutropius suffered himself to be torn with iron hooks and burned with torches rather than falsely accuse any person. Palladius’ writes that in these tortures he expired. Optatus then caused Tygrius to be scourged, and stretched upon the rack until his bones were dislocated, and finally banished him to Mesopotamia, where he died. The Church honors both of these saints with the title of martyr. In the year 428, the honors of a saint were first given to Saint John Chrysostom, and the archbishop, Saint Proculus, afterwards persuaded the emperor, Theodosius the younger, to bring the saint’s body from Comana to Constantinople; the translation of the sacred relics was performed with the utmost pomp, the entire population going forth to join in the procession. The arm of the sea over which they passed was covered with barges, and illuminated with torches. When the sacred relics arrived, the Emperor Theodosius, his eyes bathed in tears and fixed upon the coffin, humbly asked pardon of the saint for the injustice done him by his parents. This translation took place on the 28th of January, in the year 438, thirty-one years after the saint’s death.